Three qualities that make a production of William Shakespeare's As You Like It unforgettable are a most appealing Rosalind, intriguing Jacques, and sprightly pace to move things along without feeling hurried. 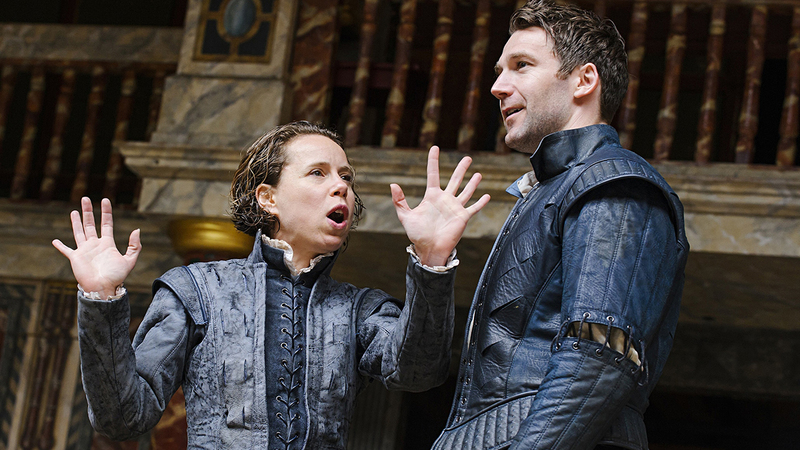 At Shakespeare's Globe in London, during summer 2015, Blanche McIntyre's staging of the 1599 comedy provided that and more. A 48-hour stopover in late May was my first foot-setting in England in nearly 30 years. Long before rehearsals had begun, tickets had been purchased for the one night I could see a play. I was fortunate indeed to be planted against the center section's back wall for a most memorable Monday in May – Memorial Day back in America. McIntyre's cast was a top-to-bottom embarrassment of riches that added a fourth quality to the three listed above. It was the way that the 400-year-old dialogue was delivered: so effortlessly and naturally that it sounded as contemporary as an exchange on "Seinfeld." We're beyond expecting this ease with the language in an American production, but when you get it, it adds an immediacy that should seduce even longtime Shakespeare resisters. We begin in "court," where Rosalind (Michelle Terry) remains after her father, Duke Senior (David Beames), was overthrown by her Uncle, Duke Frederick (also Beames). Her feisty independence soon gets her exiled after him. Accompanied by her cousin Celia (Ellie Piercy) and the court's philosopher fool, Touchstone (Daniel Crossley), she heads into the Forest of Arden to find her father and his men. For safety she disguises herself as a man she dubs 'Ganymede,' Shakespeare's reference to classic Greek ambisexuality. Before leaving, however, she and brave Orlando (Simon Harrison) are mutually smitten. Soon, learning his life is in danger, Orlando also heads into the woods with the ancient Adam Phil Whitchurch) as companion. After those busy first scenes, Shakespeare parks his vehicle inside Arden, where we watch a string of encounters between Celia, Rosalind/Ganymede, Orlando, Duke Senior and his men, including the circumspect Jacques (James Garnan), and various rustics who tend sheep or farm nearby. The central story is Rosalind's, and the playwright employs her concealment to great effect, allowing the seeing female within the seeming male to be commentator and director of her unusual courtship. By the time she first spies Orlando in Arden, he is hanging love poems to her on trees. Already wrapped in the alter ego of Ganymede, she offers him male companionship and counsel that are, of course, informed by the insights of a woman. Admittedly the product of the male Shakespeare, Rosalind has been upheld for centuries as proof of an unusually perceptive anima. Not only will Rosalind tailor her suitor to be the perfect match, she'll share with us the fun she has doing it. She will also apply her surprisingly mature perspectives on romantic equilibrium to three other forest couples incapable of finding compatibility on their own. She'll even time it so their 'A-ha' moments occur just as she reveals her true identity in the final scene, then accepts Orlando's hand and joins them at the altar. Terry, her name an echo of Britain's leading 19th Century Shakespearean, Ellen Terry, gives us a Rosalind that is, first and foremost, fun to be around. It's no wonder Celia can't stand to be parted from her. Rosalind's mirrored loyalty to her cousin is matched by Terry's loyalty to the text: steadfast yet bursting with spontaneity. Piercy creates a complementary Celia, devoted, but never competing for attention. She spends a good deal of time against the upstage wall, and clearly hangs there willingly. Harrison's Orlando reveals intelligence behind the infatuation. Despite being headlong in love, he maintains a level head and finds any opportunity the Bard allows him to engage Ganymede as an equal. In Garnan's Jacques McIntyre's production really gains a distinguishing element. As opposed to the standard Jacqueses weakened by the melancholy they carry around like log-sized chips on their shoulders, Garnan relishes and is empowered by despair. He lords it over the others, laying out the "Seven Ages of Man" speech like a professor in love with his subject. 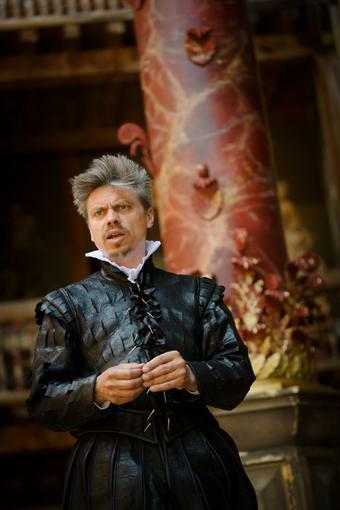 No cowering figure, this Jacques could control the stage with the aplomb of an Eddie Izzard. What hobbles so much American Shakespeare, and leaves audiences scratching their heads at how the plays became so popular, is delivery that feels too studied and mannered. Here, with crack British actors, most of whom aren't just good but exceptional, the language achieves what all dramatic dialogue seeks to attain, the sense that it is imagined as it is spoken. The flashy work is left to Garnan and Crossley. Crossley's envelop-pushing occasionally has the actor outsizing the character, but it is a singular, dismissible misstep. The rest of the cast is Patrick Driver as Corin, William Mannering as Oliver, Jack Monaghan as Silvius, Sophia Nomvete as Audrey, Gary Shelford as Charles and Hymen, and Perri Snowdon as Le Beau and Jacques de Boys. There is a quintet of traditional instrumentalists to support the songs. They are Sam Goble, Andy Harwood-White, Arngeir Hauksson, Griselda Sanderson, and Adrian Woodward, who is also musical director. Another quality that usually plays a part in a transcendent Shakespeare production is scenic design. Here at Shakespeare's Globe the stage is unadorned, except for minimal touches. The work of designer Andrew D. Edwards focuses on the clothes, and with costume supervisor Sabrina Cuniberto (and an army of wardrobe, wig and hair assistants) the results are resplendent. They play richly against the bare wood backdrop under a deceptively simple lighting design that doesn't change yet manages to avoid any shadowing and always seems to flatter. This production of As You Like It received predictably stellar notices, and sold out immediately. It is recommended that Americans heading to London check into the Globe's schedule early and book tickets far in advance. The theater tour is also great fun, and it's nice to know the man who spearheaded the building of this landmark recreation, Sam Wanamaker, was one of us.